The research activity of BrainTrends is at the core of cognitive and social neuroscience. Our research interests concern the understanding of the human behavior and the brain functioning in relation to the execution and observation of action and to direct and vicarious experience of pain. These research topics are mainly carried out by using behavioural, psychological and psychophysiological (i.e. electroencephalographic - EEG) measures. 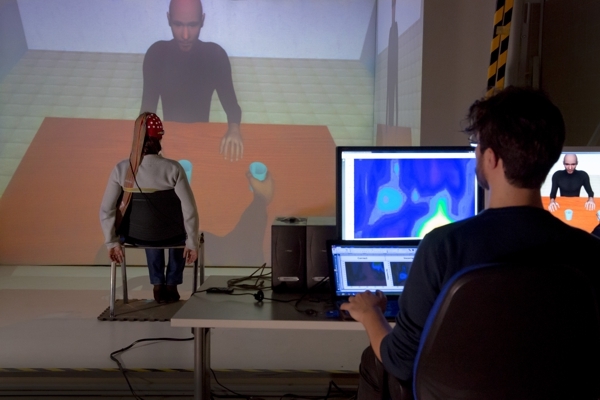 Recently, our research team has opened a new line of research, which exploits the virtual reality to create ad-hoc scenarios that simulate interpersonal relationships in order to study how our brain embodies a virtual body by exploring the EEG signatures of monitoring the actions of the avatar seen in the first perspective. This research line is now applied to brain damaged patients. (resting state networks or RSN), the effort of scientists from BrainTrends is to understand how the organization of the resting brain is modified both spatially and temporally during task performance. Within this theoretical framework, we also address how the intrinsic activity of the brain might predict the individual's attitude and predisposition and in particular our tendency to empathically react to the pain of others. Magnetoencephalographic (MEG) and Electroencephalographic (EEG) measures. by means of teaching activity and by organizing seminars and workshops.